We spent our entire month’s eating out budget in one fell swoop this week! We went out for restaurant week to a place that’s been on our minds but out of our price range since we moved here (The Melting Pot). Our meal took 2.5 hours and we had wonderful service. I even ate a bit of dessert! It was fun to have such an interactive meal. On Saturday we had our basketball group over to watch our team play – and thankfully it went much better than the game on Wednesday! It was our first gathering at our house of the season, because this game was broadcast on CBS instead of on ESPN. We hope to do this a few more times before the end of the regular season. David from Money Under 30 answer a reader question about investing money for a short-term goal. G.E. from 20 Something Finance detailed a new federal student loan repayment program called Pay as You Earn. Edward Antrobus has decided that a $1k emergency fund while they’re paying off debt is just too small. Lance from Money Life and More explains the options for splitting expenses with housemates. Suba from Wealth Informatics debunks nine reasons for not making more money. Jake from iHeartBudgets listed How Sharing a Car Has Helped Our Joint Finances in his weekly good reads. Miss T. from Prairie Eco Thrifter included How Sharing a Car Has Helped Our Joint Finances in her Friday links. nicoleandmaggie listed Frugal Practices I’ve Grown to Love in their link love. Egg on My Face: Grad Students and Payroll Taxes was featured in the Carnival of MoneyPros, the Tax Carnival #111, and the Financial Carnival for Young Adults. Blog Statistics Update December 2012 – January 2013 was featured in the Yakezie Carnival. 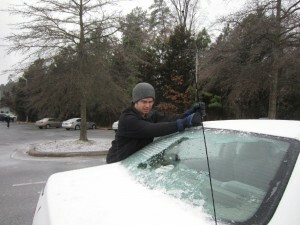 How Sharing a Car Has Helped Our Joint Finances was featured in the Festival of Frugality #372. We had so many wonderful comments this week that I couldn’t choose just one! I think this was our highest week yet both for number of comments and number of commenters – thanks everyone! 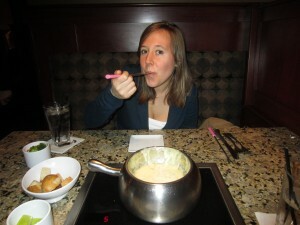 12 Responses to "Weekly Update 47"
I’m not sure if your local fondue place has a happy hour, but the one near me does and it gives you $4 off a chocolate fondue. So sometimes we make dinner and then just go there for dessert, which makes it only $12+tax, which isn’t too bad. I’ve never actually been there for dinner though I’m sure it would be delicious! I don’t think we’d go back, actually – not in the near future. It was a great meal and we enjoyed it but we’ll probably continue to check out other restaurants if we want to spend a bit of money. Thanks for the mention. It’s been really warm recently. As in, I wore a t-shirt walking to the library this afternoon. Why couldn’t I have had these temperatures last winter when I was working outside! Edward Antrobus recently posted..Is $1000 a Large Enough Emergency Fund? It’s been kind of back and forth here – 30F then 60F then back. We got quite the snow dump here too. It is taking forever to get it all shoveled. We don’t have a snow shovel, but Kyle literally chipped ice off our front step with an ice scraper! I snagged melting pot deal via one of the deal sites (Groupon maybe?) a few months ago. It included salad, cheese fondue, entree and 2 glasses of wine (for two people) for like $50. I thought it was a great deal considering how expensive it is to go there. KK @ Student Debt Survivor recently posted..My Finances, His Finances, Our Finances? That does sound like a good deal! Too bad Restaurant Week prices can’t be combined with other discounts.